Elaine Y. Ota, right, deputy director of USO Hawaii, has personally shaken the hands of and distributed snacks to thousands of soldiers on their way to deployment, and upon their return, since 2003. She is the first civilian honored by the Navy League with the American Patriot Award. Elaine Y. Ota gives a warm hug, handshake and snack to every soldier deploying from Hawaii -- and returning -- all from the heart. "Miss Elaine" -- as the troops call her -- is usually the last person they see waving as they board the plane with rifles on their backs to Iraq and Afghanistan -- since 2003, no matter the time. "It hurts my heart to know some may not come back," Ota said. As deputy director of the United Services Organization Hawaii, Ota personally greeted 20,000 troops last year. For her devotion, the United States Navy League, Honolulu Council, presented her its fourth annual American Patriot Award last month. It's the first time a civilian has won. She was honored at the Hilton Hawaiian Village, along with retired Adm. Thomas Fargo, former commander of the U.S. Pacific Command, who received the award for his career and community service. Bob McDermott, Navy League executive director, said Ota is an "unsung hero." "People like Elaine (a civilian) are certainly rare," he said. Ota devoted "a lifetime to service of country," first as a military wife and mother, and now through the USO, he said. "She is such a sweet lady who doesn't look for recognition," McDermott added. 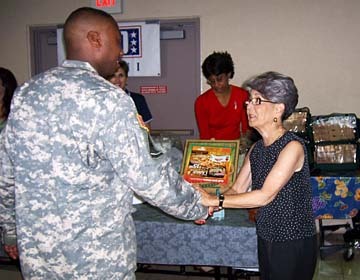 Ota initiated the USO Hospitality Announcement Program in 2003, mobilizing local businesses for donations of refreshments, and assembling several volunteers to help her. She also got Hickam Air Force Base to renovate its guest lounge and had an ATM installed for the soldiers' convenience. Her husband, retired Air Force Lt. Col. Charles Ota, has been terrific in his support, she said. "We know what it's all about. I understood what it was like to be a military wife with three children, in a strange city, driving around looking for things and getting lost," Ota said. At 69, she reflected, "Life has really changed since 2003. It's been really rewarding. ... Everything I do is from my heart." The time she has spent, sometimes 24 hours straight, "is so minimal compared to what we have in return -- freedom ... Giving a few hours of our lives -- that is truly no big deal. We have the men and women (who) are willing to sacrifice their lives for us," Ota said. For nonlocal troops, she provides a slice of fresh pizza and cookies on their way in and out. For local troops, it's usually chili and rice from Zippy's, Spam musubi, manapua or crispy gau gee. A few local soldiers returning home have cried, she said. "It was so touching." Knowing how glad the soldiers are to have someone there who cares about them, no matter what time of day or night, "I cannot NOT do this," said Ota, a retired Hawaii Visitors and Convention Bureau organizer. She said one of the soldiers told her: "Oh, my God, you're like my mom. You were here when we left and you're here when I came back."